Ever wondered what happened to the mall in The Blues Brothers after Jake, Elwood, and all those cops drove right through it? They actually left it just the way it was, but that's only the start of the Dixie Square Mall's decline. We just saw that legendary Blues Brother chase today on our list of crazy videos of cars driving through stuff. Reader Jonrev then told us the whole story of the mall itself, something I'd never heard before. Some intel on the Blues Brothers mall: it was the former Dixie Square Shopping Center in Harvey, IL; a south-suburb of Chicago. It was only open for 13 years before closing in 1979, when the city's crime rate exploded in the wake of "white flight". Timing, of course, couldn't be better for John Landis, and in August he set up shop in the vacant mall and "dressed it up" to appear fully-functional and open. 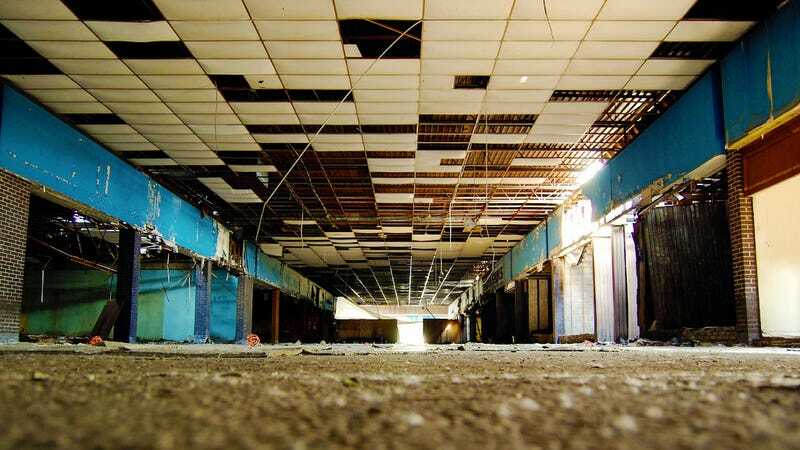 Of course, that was just Hollywood magic, and once the crew left (the mall in a disastrous state that was never repaired, despite a lawsuit that was ultimately tossed): the mall was briefly used as a school, then left to rot from 1981 onward. From there, it was a heavy crime magnet, with gang activity and vandalism taking over for the first 20 years until photographers began documenting and exploring its bombed-out shell, starting around 2003 or so. After at least one murder was committed in there, multiple arsons, roof collapses, one botched revitalization project after another, thousands of photographs, and an "accidental" demolition of one of the anchor stores that was to be purchased and used as a warehouse: it was finally demolished late last year, only-possible through the use of Hurricane Ike disaster relief funding... business as usual in Illinois. Multiple cars went through there after Jake and Elwood... Travis Bell drove easily the best Bluesmobile replica ever made through there years ago, following the same path as the original BluMo. If anyone can track down video of that recreation run, send me an e-mail, or let me know in Kinja below. Raphael at Jalopnik dot com.